Abstract: The study was undertaken to determine the attitude of farmers towards organic vegetable cultivation and explore the relationships between their selected characteristics with their attitude. Data were collected through personal interview using pre tested structured questionnaire from a sample of 65 randomly selected vegetable farmers and FGD during January to February 2015 in Pourashava and Sarafvata union under Rangunia upazila of Chittagong district. Attitude was measured against 13 statements regarding organic vegetable cultivation following five point Likert scale. To explore the relationship between the concerned variables correlation coefficient (r) was computed using SPSS. Descriptive statistics were used to describe the variables. Majority of the farmers (95.4%) had positive attitude towards organic vegetable cultivation. Correlation analysis indicates that level of education, extension media contact and agricultural training received had positive and significant relationship with their attitude score. Rana, S., Hasan, M. H., Alam, M. S. and Islam, M. S. (2017). Farmer attitude towards organic vegetable cultivation in Rangunia Upazila, Chittagong, Bangladesh. Journal of Bioscience and Agriculture Research, 14(01), 1151-1156. ​Rana, S., Hasan, M. H., Alam, M. S. and Islam, M. S. "Farmer attitude towards organic vegetable cultivation in Rangunia Upazila, Chittagong, Bangladesh." Journal of Bioscience and Agriculture Research, 14.01(2017), 1151-1156. Rana, S., Hasan, M. H., Alam, M. S. and Islam, M. S. "Farmer attitude towards organic vegetable cultivation in Rangunia Upazila, Chittagong, Bangladesh." Journal of Bioscience and Agriculture Research, 14 no.01(2017), 1151-1156. Abstract: Classification of fresh water fish cyprinidae is hampered by complexity or lack of morphological diversity. In this study we analyse besed on mtDNA sequences were undertaken to clarify phylogenetic relationship Aburahaya (Rhynchocypris lagowskii) among various site in Tohoku, Japan. Evolutionary rate in cytochrome b gene (Cyt-b) region we examined. To assess genetic structure within these populations we analyzed using statistical parsimony networks and relationships between the populations were examined using a neighbor-joining (NJ) method. Three major geographical groups are found in this study. The most parsimonious network of mtDNA haplotype of aburahaya 19 localities, estimated using the TCS algorithm. In this network also showed three geographical groups. Haplotype 1-32 is one group, haplotype 33-36 is group 2, haplotype 37-53 is group 3 and 54 is out group. Hassan, C. M. M., Ishikawa, T., Seki, S. and Mahmuda, A. “Appearance of the non-indigenous mtDNA haplotypes of Rhynchocypris lagowskii in Tohoku, Japan”. Journal of Bioscience and Agriculture Research, 14.01(2017), 1157-1164. Hassan, C. M. M., Ishikawa, T., Seki, S. and Mahmuda, A. “Appearance of the non-indigenous mtDNA haplotypes of Rhynchocypris lagowskii in Tohoku, Japan”. Journal of Bioscience and Agriculture Research, 14. no. 01(2017), 1157-1164. Authors: Haider, M. R., Bhowmick, N. G., Begum, N., Zashimuddin, M. and Hoque, M. A.
Abstract: Suitable plantation technique is important for establishing plantation of different species from better germination, growth performance, economic and environmental point of view. Two plantation techniques, polybag seedlings and thali (direct seeding on ring shaped cleared soil), were studied from 2005 to 2014 in order to find out the superior one for establishing plantations of Dipterocarpus turbinatus and Syzygium firmum. Results revealed that polybag seedlings of Dipterocarpus turbinatus and Syzygium firmum had little bit higher germination percentage, germination value and germination energy than thali. None of these values of polybag seedlings and thali are significantly different except germination value and germination energy of Dipterocarpus turbinatus. Cumulative germination percentage of both species was higher at the initial stage for polybag seedlings than thali. Growth performance up to 9.5 years of Dipterocarpus turbinatus showed that for polybag seedlings the average height, average diameter at breast height (DBH), mean annual increment (MAI) of height and MAI of DBH are comparatively higher, with no significant difference than thali. On the other hand, these growth parameters of Syzygium firmum are higher for polybag seedlings at 5% significant level than thali. The survival percentage of Dipterocarpus turbinatus was higher (78.67 ± 9.33%) in plantations raised from thali (direct seeding) than polybag raised seedlings (69.33 ± 9.61%). The financial analysis was very positive for thali since expenditure incureed for establishing plantations by thali was much lower (6.70 BDTk./individual) than polybag seedlings (15.60 BDTk./individual). Considering the germination potentiality, growth performances, financial invovement and environmental point of view, the study suggested that the thali technique or direct seeding may be suitable for teli-garjan (Dipterocarpus turbinatus) and dhaki-jam (Syzygium firmum) plantation. Haider, M. R., Bhowmick, N. G., Begum, N., Zashimuddin, M. and Hoque, M. A. (2017). Planting technique of Teli-garjan (Dipterocarpus turbinatus Gaertn.) and Dhaki-jam (Syzygium firmum Thw.) in degraded hills of Chittagong, Bangladesh. Journal of Bioscience and Agriculture Research,14(01), 1165-1173. Haider, M. R., Bhowmick, N. G., Begum, N., Zashimuddin, M. and Hoque, M. A. “Planting technique of Teli-garjan (Dipterocarpus turbinatus Gaertn.) and Dhaki-jam (Syzygium firmum Thw.) in degraded hills of Chittagong, Bangladesh”. Journal of Bioscience and Agriculture Research, 14.01(2017), 1165-1173. Haider, M. R., Bhowmick, N. G., Begum, N., Zashimuddin, M. and Hoque, M. A. “Planting technique of Teli-garjan (Dipterocarpus turbinatus Gaertn.) and Dhaki-jam (Syzygium firmum Thw.) in degraded hills of Chittagong, Bangladesh”. Journal of Bioscience and Agriculture Research, 14. no. 01(2017), 1165-1173. Abstract: Organic fertilizers are alterations aiming to improve soil fertility have been found to increase pest populations on cabbage plants. This study was conducted to evaluate the effects of organic fertilizers and weather factors on insect infestation with cabbage cultivars during rabi season of 2007-2008. Two cabbage varieties viz., Atlas 70 and Super tropic and organic fertilizers like control, cowdung, mustard oilcake, Vermicompost and Trichoderma were included in this study. Results revealed that the minimum no. of infested plants plot-1, infested leaves plant-1 and percent infested leaves plant-1 were found in variety super tropic with Trichoderma applied plots on different dates of observation while the maximum no. of infested plants plot-1, infested leaves plant-1 and percent infested leaves plant-1 were in variety super tropic and mustard oil cake applied plots. The highest number and percent (4.00 plot-1) and (20.00% plot-1) of infested heads were found in variety Super tropic and mustard oil cake applied plots. Highest number of healthy heads plot-1 (19.67), healthy head yield (71.47 ton/ha) and total head yield (72.14 ton/ha) were recorded in variety Super tropic and Trichoderma applied plots while the lowest number of healthy heads plot-1, healthy head yield and total head yield were recorded in in variety Super tropic and mustard oil cake applied plots. So application of Trichoderma with Super tropic cultivar ensures low insect infestation and better head yield. Hossain, M. J., Khan , G. M., Uddin, M. G., Rahman, M. T. and Hassan, K. M. M. (2017). Effect of organic fertilizers on major insect infestation in two cabbage cultivars. Bangladesh. Journal of Bioscience and Agriculture Research,14(01), 1183-1189. Hossain, M. J., Khan , G. M., Uddin, M. G., Rahman, M. T. and Hassan, K. M. M. “Effect of organic fertilizers on major insect infestation in two cabbage cultivars”. Bangladesh. Journal of Bioscience and Agriculture Research,14.01(2017): 1183-1189. Hossain, M. J., Khan , G. M., Uddin, M. G., Rahman, M. T. and Hassan, K. M. M. “Effect of organic fertilizers on major insect infestation in two cabbage cultivars”. Bangladesh. Journal of Bioscience and Agriculture Research,14.no.01(2017): 1183-1189. Authors: Ahmmed, M. M. , Hossain, F. and Quddus, A. F. M. R.
Authors: Hossain, M. S., Kader, M. A. and Islam, N.
Authors: Kazemi, J. S., Aboutalebian, M. A. and Mesgarbashee, M.
Abstract: For study the effects of priming and mycorrhiza on improving the balance of sodium and potassium and some changes antioxidants in the leaves of maize under soil salinity. This experiment was laid out in a randomized complete block design as factorial with three replications in two years 2014/15- 2015/16 in two place of saline and non-saline on hybrid corn NS640. The first factor inoculated and non-inoculated with mycorrhiza (Glomus mossea), the second factor in four level osmopriming with Nacl solution, priming with salicylic acid, priming with tap water and non-prime(control). Solutions concentration and Prime duration were determined in separate experiments. The results showed that the enzymes catalase and peroxidase, Superoxide dismutase, soluble proteins and potassium increased in leaves in both the saline and non-saline, inoculation with mycorrhiza and primed with salicylic acid than non-inoculation and non-primed that this increasing in saline soils was more. The sodium in inoculation with mycorrhiza and prime with salicylic acid than non-prime and non-inoculation in both the saline and non-saline especially saline environment is leading to a decrease in leaf. Colonization percent, the percentage of emergence and emergence rate of inoculation with mycorrhiza and primed with salicylic acid than non-inoculation and non-prime in both environments has been increasing, especially in non-saline environment. Kazemi, J. S., Aboutalebian, M. A. and Mesgarbashee, M. (2017). Effects of priming and mycorrhiza on improving balance of sodium and potassium and changes of antioxidants in leaves of maize under soil salinity. 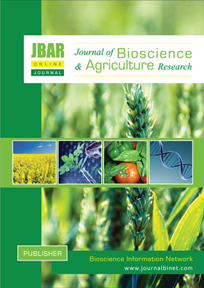 Journal of Bioscience and Agriculture Research,14(02),1210-1221. Kazemi, J. S., Aboutalebian, M. A. and Mesgarbashee, M. “Effects of priming and mycorrhiza on improving balance of sodium and potassium and changes of antioxidants in leaves of maize under soil salinity”. Journal of Bioscience and Agriculture Research, 14.02(2017), 1210-1221. Kazemi, J. S., Aboutalebian, M. A. and Mesgarbashee, M. “Effects of priming and mycorrhiza on improving balance of sodium and potassium and changes of antioxidants in leaves of maize under soil salinity”. Journal of Bioscience and Agriculture Research, 14. no. 02(2017), 1210-1221. Authors: Adugna, O., Quarishi, S. and Bedadi, B.
Abstract: Soil erosion affects the sustainable use of soil resources through its influence on soil properties. Proper use of tillage can improve soil related constraints, while improper tillage may cause a range of undesirable processes. Conservation tillage like no tillage had been reported to improve the properties of the soil. Thus, the study had been carried out at Assosa Agricultural research center to evaluate the effects of tillage and cropping system on soil chemical and in situ moisture conservation. Eighteen experimental runoff plots of 8 m long and 3 m wide each were framed with corrugated iron sheets. The experimental design used was randomized complete block design (RCBD) with six treatment in factorial combinations vis-à-vis three cropping systems (sole maize, sole soya bean and intercropping of maize with soya bean), with tillage system (no tillage and convectional tillage), that were replicated three times. The treatments had shown non-significant variation for all parameters showing Enrichment ratio of ≥ 1 except some no tillage treatments. Higher enrichment ratios for clay and silt fraction were observed under conventional tillage treatments and thereby high loss of nutrients like nitrogen, available phosphorus, and organic carbon than no tillage treatments. No tillage with soya bean and no tillage with intercropping treatments had shown the value of ≤ 1 for total nitrogen and phosphorus than conventional tillage treatments. No tillage treatments in concomitant with cropping system especially intercropping had retained more nutrients than conventional tillage by reducing runoff and soil loss to Enrichment ratio of ≤ 1.This study revealed the potential of no tillage with mulch to reduce nutrient losses and enrichment ratio. Adugna, O., Quarishi, S. and Bedadi, B. (2017). Effects of water erosion on soil chemical loss under different tillage and cropping system in clay loam soil at Assosa, Ethiopia. Journal of Bioscience and Agriculture Research,14(02), 1222-1230. Adugna, O., Quarishi, S. and Bedadi, B. “Effects of water erosion on soil chemical loss under different tillage and cropping system in clay loam soil at Assosa, Ethiopia”. Journal of Bioscience and Agriculture Research, 14.02(2017), 1222-1230.